Property Owners: List your Lower Normandy property on the premier site specialising in French holiday lets. More Info. View all villas and gites in Lower Normandy. In order to make the most of your time and really feel that you are living the life of your hosts, try a gite holiday. Gites in Lower Normandy are well appointed and make for a relaxing stay. 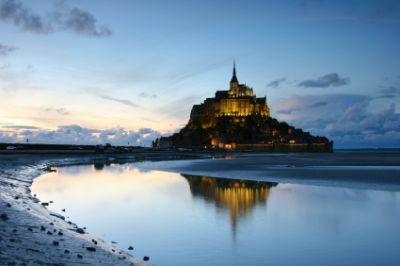 Alternatively, you might care to try one of the Lower Normandy villas. Like the gites, they are immaculately turned out and make you feel welcome as soon as you step over the threshold. Caen, the capital of the region, was largely destroyed in 1944, but has since been rebuilt. It’s now a very modern town, but the main attraction is probably the Memorial for Peace, a museum and war memorial commemorating World War II and the Battle for Caen. During the summer, many tourists gather there to remember those relatively recent events that shaped the lives of so many, and which still mean so much to them and the local population. You no doubt learned about the Bayeux tapestry at school, so now is the perfect opportunity to see it and the place where it was made. Bayeux, a sleepy town of cobbled streets, small shops and timbered dwellings in the Norman style, lies on the River Aure, a few kilometres to the north-west of Caen, and the famous tapestry can be seen at the Musée de la Reine Mathilde. A site with a nautical feel to it is Le Cité de la Mer. This Cherbourg museum features the deepest aquarium in Europe and the opportunity to look around Redoubtable, a French army submarine that’s reputed to be the biggest submarine it’s possible to visit anywhere on the face of the Earth. Over the years, Lower Normandy farms have built a reputation for the quality and taste of their output. Normandy Camembert is probably known all over the world for its consistently high quality, texture and taste, and while it’s important to try some in situ, remember that there are other cheeses for your taste buds to hanker after; the small, square Pont l’Evêque, covered in a pale orange rind, and Livrarot, recognisable by its stripy rind, are just two to be going on with. Meat eaters will enjoy Andouille de Vire, a traditionally made pork sausage. Simple and rustic, it’s always tasty, and very satisfying when sliced on fresh farmhouse bread. Popular among tourists and locals is Tripes à la mode de Caen, another traditional dish. It’s basically a meat casserole made from beef offal, but with a special French touch. For those with a sweet tooth, the Caramels au Beurre d’Isigny, made with locally produced salted butter, are certainly something to keep the gastric juices alert between meals, and it’s a good idea to keep some handy at all times. When it comes to drinks, Normandy is right up there with the best of them. Its ciders are wonderfully refreshing on a hot day, to say nothing about their intense flavours, while Pommeau is a good aperitif and Poiré a pleasant light-bodied pear liqueur. In fact, there are several different liqueurs, all worth sampling. But finally, and perhaps leaving the best to last, a mention for Calvados. Known as Calva by the locals, it exists in both the original and cream forms, both of which are exquisite.